NOAH Startup Competition: Voting Open! Last November in London, leaders of the digital economy met at NOAH 2016, a two-day networking conference for executives from internet companies and investors. During the conference 74 companies introduced themselves through a 5-minute pitch. If you haven’t seen CodeMonkey’s pitch, you can watch it here. CodeMonkey is now in the running to win #1 Startup at NOAH. 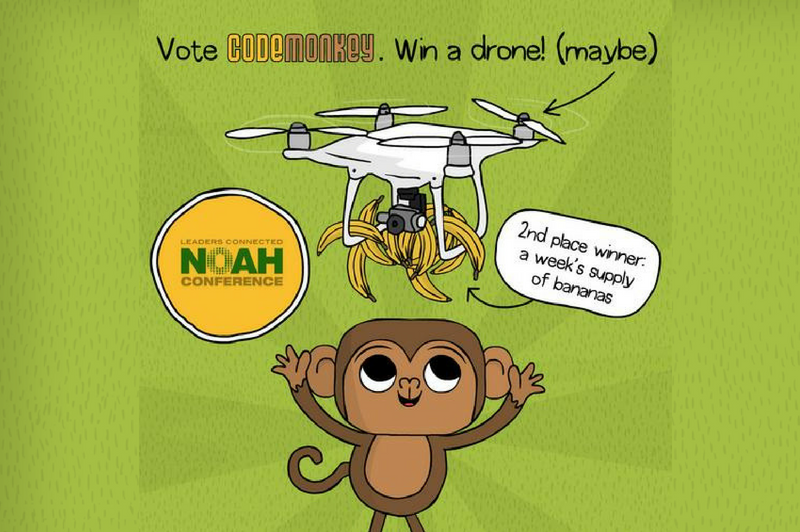 With your vote, YOU can help us win the 1st place prize and the amazing opportunity to present CodeMonkey on the main stage at the next NOAH conference in Berlin and help more kids learn how to write REAL code! Don’t wait to participate! Voting closes on February 28th. *Don’t fret – We’re not about to tell you restrictions apply! Just here to say we want you to know how much you mean to us so we are giving all participants a free one-month CodeMonkey home subscription! – Check your email! Only here will you find your free one-month subscription and whether you won! Currently ,the technology is very advanced .it has become popular in a very short period of time .